Here is the recipe that I use for Chocolate Caramel Slices. I don’t remember where I got this recipe from, but I have used it for as long as I can remember, and the results sure taste good. I like sharing these when I bake them, but make sure I keep quite a few for my own consumption. The filling can be tricky because you need the right temperature but to work quickly so the caramel filling doesn’t end up with lumps in it. It’s fun to melt chocolate in a glass bowl over a saucepan of simmering water and to pour the chocolate onto the base and filling, then even better fun to score or mark the rows and squares and pop the tray into the refrigerator. The best part is – eating them – of course! 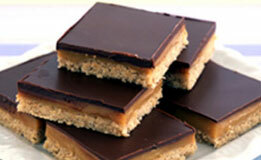 Categories: Biscuits & Slices, Food | Tags: biscuits, chocolate caramel slice, food | Permalink.